The last week of May 2017 will be remembered as another “freeway fight” in Chinatown’s history. Many speakers who showed up to oppose the Beedie Group’s proposed condo tower at 105 Keefer Street remembered the 1970s fight waged by Chinatown residents and leaders against the City’s plan to level huge sections of their neighbourhood for a freeway. Some of those standing against this condo tower were the very same people who fought the freeway 45 years ago. And many of the politics of the two fights are the same – like the freeway plan, the Beedie condo plan threatens the urban fabric of Chinatown; it would similarly disrupt and displace the unique and vulnerable cultural life of Chinatown, and; it would uproot and displace low-income Chinese residents. The economic quake caused by the Beedie condo tower would continue the gentrification and yuppie homogenization of Chinatown, displacing those Chinese seniors most vulnerable to the upscaling of the neighbourhood and the raising of rents. In honour of this fight The Volcano is publishing a selection of speeches made at the 105 Keefer rezoning hearing. There were many many powerful, personal testimonies, and sharp anti-gentrification and anti-colonial speeches made at Vancouver City Hall over these four hearing dates. We think this selection captures the main ideas presented, reveals the importance of this moment in Chinatown history, and demonstrates the power of this community. The unity of Chinese elders and youth, brought together from throughout Vancouver in defense of Chinatown as a cultural and historic centre to fight for, is a powerful grassroots political force. Perhaps the most significant part of the mobilization against 105 Keefer will prove to be the power of this united group as they fight against the combined forces of capitalism, colonialism, and white supremacy. Regardless of the outcome of this hearing, an intergenerational working-class Chinese resistance is mobilized and will change the future of Vancouver. – The Volcano. Over the course of 4 public hearing sessions starting Tuesday May 23rd and ending Monday May 29th, nearly 300 speakers signed up to speak about a proposed condo tower at 105 Keefer Street, in the heart of Chinatown. The great majority of these Chinatown residents, organizations, and community members who descended on Vancouver City Hall demanded that the City of Vancouver refuse this rezoning proposal and block this condo tower to protect low-income residents and the heart of Chinatown, not corporate developer profits. After four revisions and over two years of consultations and mobilizations, Chinatown Concern Group, Chinatown Action Group, and other youth organizations won small concessions from the 105 Keefer St. project: 25 senior units, temporary space for a private seniors’ organization, and a 23% reduction in market units (137 to 110 units). Still, the project threatens to displace Chinatown’s predominantly low-income community. One after another, speakers argued that 110 market units will dramatically increase rents in the neighbourhood and the token 25 senior units are likely to be still out of reach for low-income tenants. Instead, Chinatown Concern Group is calling for 100% welfare-pension rate social housing and public and permanent cultural community space. In the face of this major opposition and community mobilization, Vancouver City Council deferred the decision on the rezoning application to June 13th, 2017. 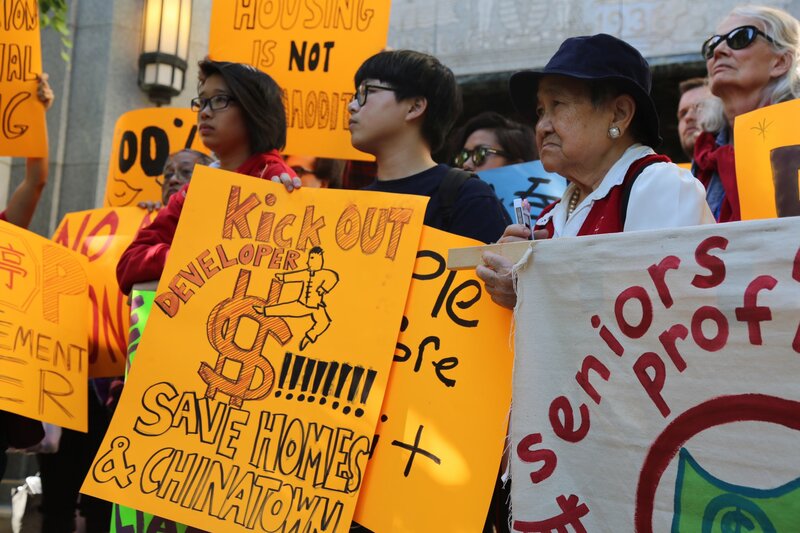 Chinatown Concern Group (CCG) and Chinatown Action Group (CAG) continue to call on Vancouver City Council to reject Beedie Living’s rezoning application at the 105 Keefer site in Chinatown. 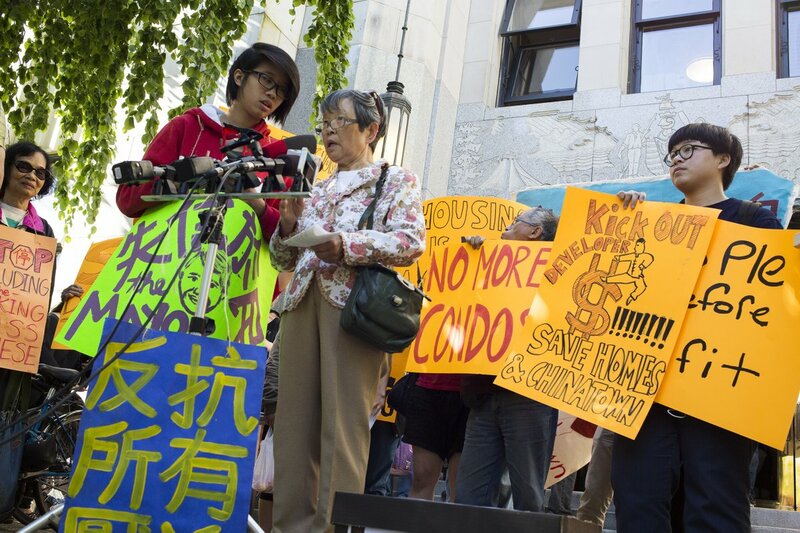 The battle against 105 Keefer symbolizes the broader ongoing struggle against gentrification, which was accelerated by the upzoning of Chinatown in 2011 by City Council. The rezoning process also reveals a deeply flawed process of democratic engagement. For instance, the public hearing for 105 Keefer showed that Chinese-speaking residents are currently not able to participate equally in consultation processes, as Council declined to provide language interpretation of their proceedings. Council also decided that any interpretation into English would count within each speaker’s 5-minute time limit, effectively reducing how much Chinese-speaking residents were allowed to comment. Furthermore, after three nights filled with hundreds of speakers, Mayor and Council decided to reconvene at 9:30 am on Monday, which effectively barred the attendance of many speakers and the public, particularly working-class residents. Over the course of the week-long public hearing, CAG and CCG members, along with other speakers, called out these racist and exclusionary procedures, which seemed to have fallen on deaf ears at City Hall. CAG and CCG vow to continue the fight for much-needed social housing in the neighbourhood while City Council wavers on a decision. In addition to opposing the condo development at 105 Keefer, CCG and CAG have developed a broader long-term strategy and vision for Chinatown to safeguard affordability and quality of life for Chinatown’s seniors and low-income residents.